Don't you just hate receiving quests in FrontierVille that ask you to sell 50 Sheep, or sell 25 Oxen, only to have just finished a quest that required you to sell them all already? Now you're stuck purchasing and growing animals all over again, in what is undeniably a time consuming process (or an expensive one, if you choose to buy Boosts). Your pain can be lessened a bit, however, by simply completing the Bear Collection. The Bear Collection gives you a free Animal Ready Boost when you turn it in, causing all of the animals on your Homestead to instantly become "ready" to be fed. But I know what you're thinking - "The Bear Collection is way too hard to complete! I never have enough trees around, and Bears never come out on my land!" While I unfortunately can't help you bring out more Bears on your land (other than suggesting to let your trees grow to maturity before you ever chop them), I can help you complete that Bear Collection all the same. Meet us behind the break for a set of tips on how to complete the Bear Collection (believe me, it's a trick you may not know about), and earn those free Animal Ready Boosts for your land! The Mystery Animal Collection can be completed by either tending to your own Mystery Animals, or by tending to your friends' Mystery Animals when you visit. Turning this collection in will reward you with a Stuffed Bear. This isn't just a regular decorative item, however, as this is actually the key to this entire method! Once you have the Stuffed Bear on your land, you'll want to keep it out in the open - somewhere that you can easily click on it everyday, and won't forget to do so. That is, if you're like me, you won't want to put it in the far corner of your land, or else you'll forget it exists and miss out on these free items! 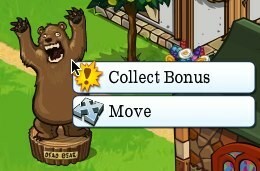 You can collect a bonus from the Stuffed Bear just as you can collect a bonus from all of your buildings. Simply click on the Bear and then click on "Collect Bonus." This bonus can only be collected once every 24 hours, but you'll receive a free collectible item from the Bear Collection when you do so. Sure, you may not be guaranteed to receive the elusive Bear Claw (the rarest item in the collection) each time you collect your bonus, but if you've gone days or weeks without seeing an actual Bear varmint on your land, you'll likely be happy with any item that you can get! And there you have it! An easy way to earn Bear Collection items, that doesn't require you to fill your land with trees, and hope to luckily receive a Bear while wasting all of your energy chopping them down. If you need help finishing the Mystery Animal Collection to receive a Stuffed Bear in the first place, remember to ask your friends if they have any spare items, as they'll likely be much more willing to share those with you than actual Bear Collection items. For more of our FrontierVille Tips and Tricks, click right here. Did you know that the Stuffed Bear item gave away free Bear Collection items? Have you been using this method to receive free Animal Ready boosts on your land? Share your experiences with us in the comments.